Since the gloomy weather of the past few days here has made my scarf photos come out woefully dark, I took a look at my archive pics of scarfs as I’ve worn them in the past to show you. The first pic is of the 90 dip dye I have already shown you here, La Danse de Cheval Mawari makes for the softest thing one can wear around the neck. I sometimes think the colours washes me out a bit, but here it looks okay, if I say so myself. I wore the smoky blue large size scarf you see above in London for Neil’s Vanilla evening for Perfume Lovers London and despite not actually applying any perfume myself that day, it still smells of vanilla. Love that. Concours d’Etrières en vanille. La Songe de la Licorne – The Unicorn’s Dream. What a name! I don’t quite see why this design bears that particular name, but I love it anyway. This is a chameleon scarf, the colours – salmon, peach, rust and oatmeal – look different in every light. 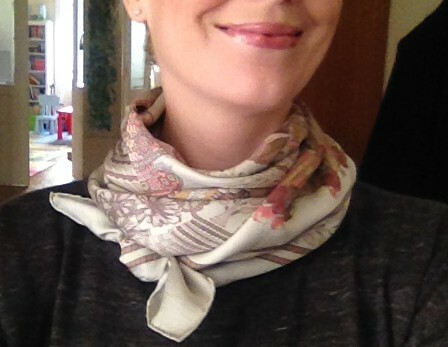 And finally, here is a photo of a 90 scarf (Mythiques Phoenix) half hidden in a cowl-neck sweater. I like this look since it makes a plain sweater more interesting and also keeps my skin away from wool, which makes me itch. After this selfie assault on your senses, I want to show you a current obsession of mine that is neither very orginal nor very sensible. 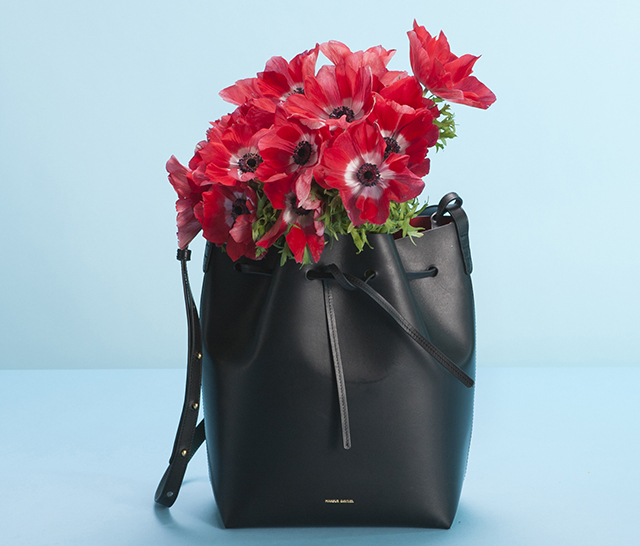 The Mansur Gavriel bucket bag. I am late to the hype, but I’m there with a vengeance. I dream of this bag at night and fantasize about it during the day. It is stupid to obsess over a piece of leather, but look – isn’t it pretty? Mansur Gavriel is a young brand, just two years on the market, but they are perpetually sold out worldwide, since the simple and elegant bags seem to have hit a nerve with the fashion crowd. Their much friendlier pricepoint compared to other luxury brand bags helps too. The company’s official photos with flowers are too gorgeous. This is the bucket bag in Brandy/Raw. Large Bucket bag in Black/Flamma. Large Bucket bag in Cammello/Sun. 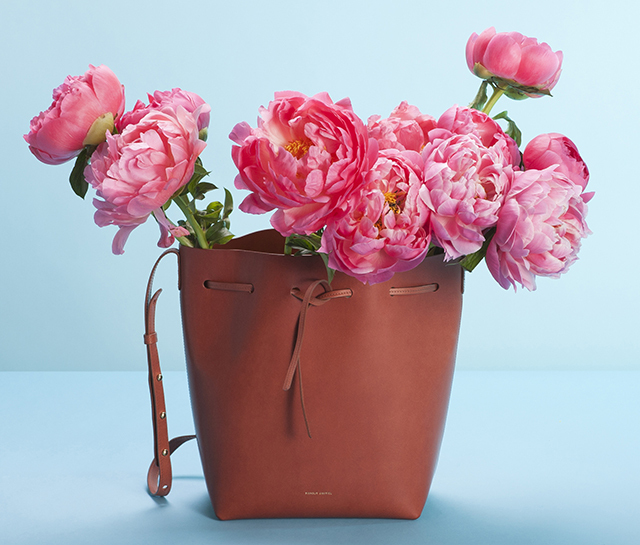 And for good measure… the tote (Large Tote in Cammello/Rosa). Sigh. What do you think of the bags? Have you heard of them? 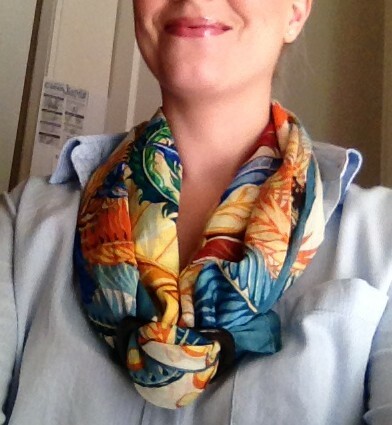 This entry was posted in Hermès, Scarf Collection, Scarves and tagged Hermes, Silk scarves. Bookmark the permalink. You are wise beyond your years. Happy wife, happy life. Glad you liked this, V.
As for the buckets, I guess there are more practical styles out there, but that is not quite the point, is it? WOW! That Phoenix Mythiques, id that the flamingos? It’s one I particularly love and your colourway is ZING! 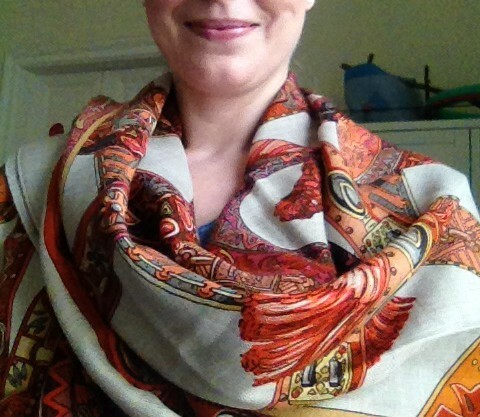 great to see these scarves being worn Birgit. No, it’s the Phoenix. 🙂 The Flamingos of this season are by the same artist though (Toutsy aka Laurence Bourthoumieux). HA!! You wouldn’t want me to lie and you did ask. Long time reader, first time commenter :), from one of the formerly Habsburg lands. Love your blog! Although the neutrally-coloured scarves are versatile and sensible and such, I prefer the livelier colours, both on you and on me (though all my scarves are of the high street variety). As to the bags, they’re okay, but I may not be fashionista enough to judge competently. Pics of you actually wearing the scarves are my favourite. I think the Unicorn’s Dream is particularly striking (plus what a great name) and the Phoenix Mythiques in summery colours will be perfect for Tuscany. Panic buy the bags immediately! I look forward to wearing the pareo this summer. BTW I supported ODOU via the Indiego crowdfunding, a great project! Thank you for your ODOU support, Hamamelis! The tote is really pretty, love the soft colours. I use the reusable shopping bags too, so practical and good for my conscience too. I love the pictures of you modeling the scarves, it really shows how beautiful they are. Scarf under the sweater is particularly nice. I don´t wear wool sweaters because they itch so much. Actually I do not wear anything that needs to be pulled over my head because it makes unbelievably claustrophobic. Cardigans and hoodies are better. Bag is nice but I am a bit funny with bags. There is such a rip-off bag culture out there. As my grandmother used to say – if the (bag, clothing piece, shoes etc) had a Marks and Spencer label on them, would you like them just as much? I would like these bags with a M&S label too (if the leather quality and craftsmanship was the same, which is mostly the problem with cheap things). The sweater in the pic is actually a cardigan, so that would work for you too. Ha, true. I’m particular about my cosmetics too. LOVE the bags. 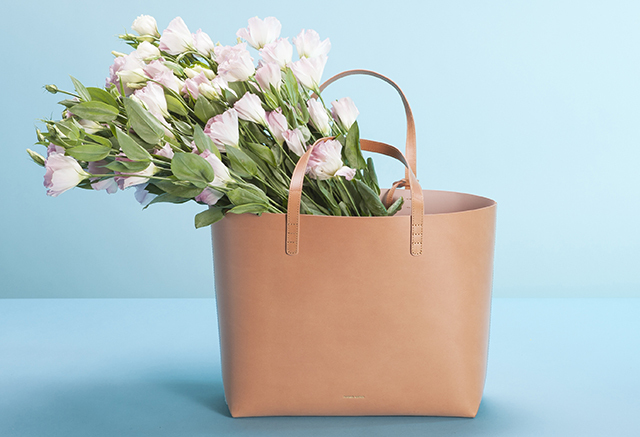 Was seriously considering investing in one, but ended up with a offwhite oversized tote from Cuyana instead. Yay for Cuyana! A great quality brand as well. Congratulations on your new bag, Hilde! Love your scarf magic. I do envy that your lipstick also looks perfectly done in every photo too. The bag photos are great as I am looking for a bag, good to know they are out so it will save looking. I was interested in a bag you mentioned awhile back from cuyana. As I live near San Francisco where their store is, I went and took a look at their collection. Very nice, glad I followed up on your lead. It may be my present to myself once report cards done. I like the bags posted today, but the cuyana are slightly more affordable! Birgit, I always look forward to these posts. My favorite scarf in this particular group of photos is the first one, La Danse de Cheval Mawari, followed by the Mythiques Phoenix 90 that you show in the last one, beneath your sweater (which is also gorgeous). I think my selections might also be based on the daintier way in which these scarves are folded: I really like that look on you, so precise and elegant. The handbags don’t wow me … except for maybe the one in black. OK, yes, that one is tempting! The black would be my first choice too, so elegant and simple. You are beautiful in scarves 1 and 3, the soft colourways! I’m glad you returned scarf 4 – too yellow. We have a similar skin tone, but I’m brunette. The bags are likely more impressive in person than in the photos. 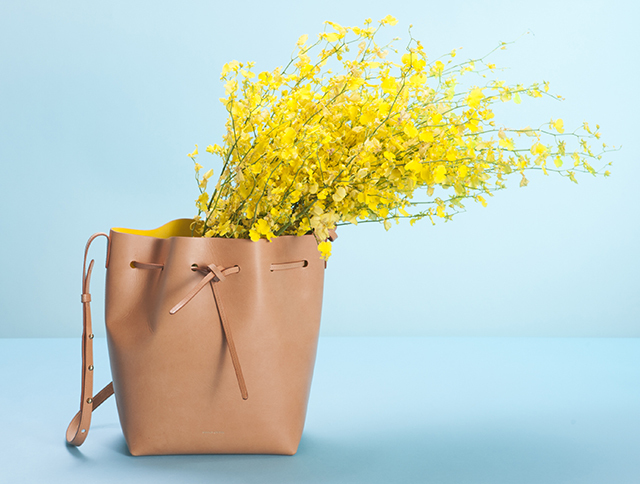 Have you seen the Reed Krackoff bucket bags? That’s the type of bucket/tote I see you with. The MG bags are definitely gorgeous in person. 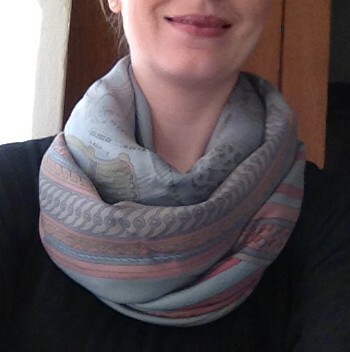 The pictures of the scarves being worn are lovely, Birgit! 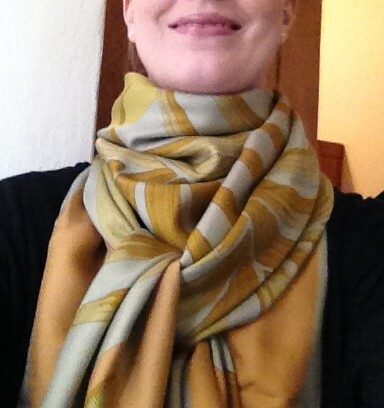 I like the little silk neck scarf under a wool cowl, great look, and the colors in the cotton scarf are very appealing. Perfect for an Italian vacation 😊 I haven’t heard of Mansur Gavriel bags but they are stunning. Which color are you most interested in? The scarves are lovely..I wish I knew how to tie them as well as you do. I look at diagrams, but am left-handed and get knots and ties all mixed up..Thanks for the lovely photos. I didn’t know about those bags, but like their clean elegance. I just experiment with the scarfs until something looks good, don’t stick too close to diagrams, they can be confusing. Love the modeling pictures of the scarves. Please oh pretty please stop showing me beautiful bags that are impossible to come by. Great pictures! Thank you for sharing, Birgit! Hehe, yes. But you are totally right (as usual), the practicality and privacy issue is there, but I found a way to neatly circumvent that. (The brand has a cool and elegant backpack – who knew such a combo existed – that is the ideal solution, a fusion of asthetics and functionality). Undina- you remind me so much of my mom (she is Aquarius too! and not just because of this statement). She won’t even look /consider a a bag if she thought it were impractical. I always look forward to your scarf posts (I LOVE fabric though I have stopped buying silk) and often compose comments in my head that I don’t end up posting. ah well. The Dip Dyes do have a soft muted look that is quite lovely. I don’t usually buy leather but if I did I would probably be drooling over these. Surprisingly the one that I like best is the Camello/Sun (because I usually dont like Tan type colors) with the yellow flowers- I’m loving that color combination with the blue background.I know you like the black the best but this is the one I would I have thought was most you for some reason. The Brandy color is lovely as well. The leather looks very soft and and supple (and not cheap..lol). Ah, Lavanya, what a lovely comment! I’m glad you went into “the orange” and enjoyed yourself. Vetiver Tonka is a beauty! 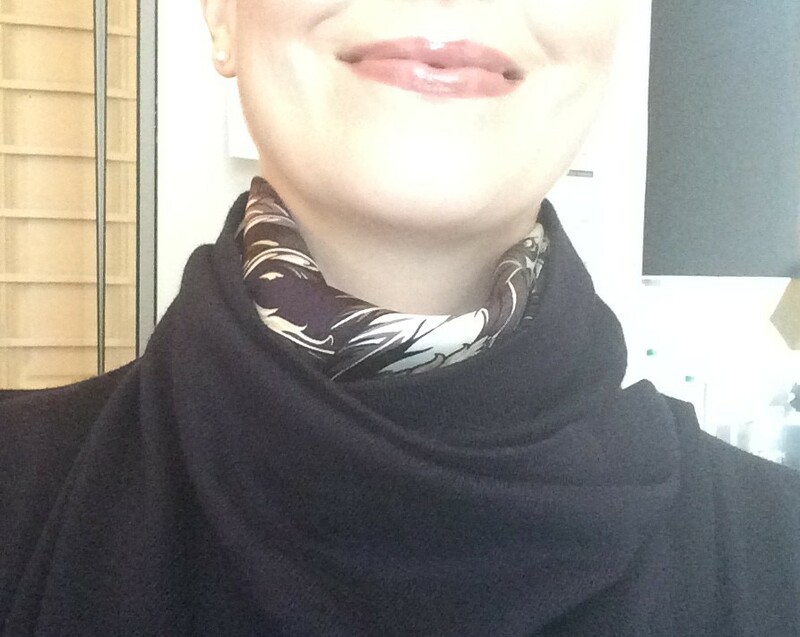 Glad you enjoy the scarf posts and good to hear from you! I hope you and your little ones are very well. Mythiques phoenix” looks stunningly elegant. As far as I can see from the picture, the colour is mauve or very dark chocolate brown? The colours looks black and white (and shades of grey) from a distance, but are actually a very dark green, aubergine and midnight blue. Good eye, Preska! 🙂 Congrats on all the beautiful scarves. You have a penchant for Dip Dye, don’t you? I’m totally in love with your cotton Pareo! Wow! The colors – striking! you’ll be wearing that pareo as a dress when you’re on holiday. The Tigre Royal dip dye is fabulous on you. You have a lovely long neck which suits scarves and all of them look great, but one thing caught my eye in the first pic…that cute, little blue chair, which is so sweet – you’ve been photobombed! Good for you! It is a lovely bag you’ve got, I particularly like the brandy colour.